French Bulldogs are expensive to raise. They are also expensive to purchase and own. We do our best to breed healthy dogs that will be family members for years to come. 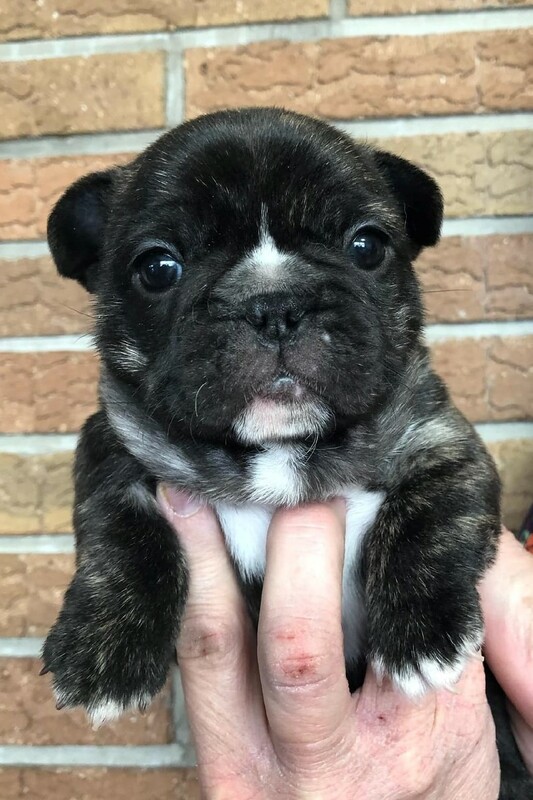 With a Piper puppy you will not find the cheapest puppy, but you will find a good example of the breed, a well socialized puppy with a guarantee of life threatening genetic health issues for one year. Please read to the bottom of this page it will answer most questions. A litter of three pups will be available See below only one is shown due to limited space. I don't have any puppies now. Please check back in the spring. We hope to have two this spring. All puppies placed from our home are vaccinated and health checked by a Licensed Veterinarian prior to going to their new homes. All puppies will have a microchip for permanent identification. There will be a pedigree and records of the health testing of the parents. We do our best to place puppies in the best homes and try to match the personality of the puppy to the new family. Puppies sold with a pet contract will be required to be spayed or neutered. We do not sell puppies to parties who wish only to breed. French bulldogs rarely whelp naturally and usually require a cesarean section delivery so they are not a breed for those who think they are going to raise puppies for profit. There is a strict contract for those puppies sold to both pet and show homes. Puppies sold as show prospect are selected, and are just that. I use my best judgement to select those puppies I believe will be competitive enough to finish their championship. These puppies will be held up to twelve weeks to gain my confidence that they will indeed be competitive. There is no way to predict the future; so puppies sold on Show Prospect Contracts will be guaranteed for health but can not be guaranteed they will become champions. Because I do hold puppies for evaluation I sometimes have older puppies available. They will be started on house training and at a point where they are easily trained. We start litter box training at an early age so they learn that (potty) is supposed to happen in certain areas. They are then exposed to out door potty time. An older puppy may be a great choice for your family so be open to the thought that you may want to consider a slightly older puppy. Older puppies are not cheaper due to the fact they usually have had continued vet care and training and therefore will be easier on the new owner overall. I also can refer you to other breeders I would trust to place a new family member with you. Sometimes that may be an adult that has retired or just didn't want to show. There are usually fees for all Frenchies. Feel free to contact me if you are looking for a new Frenchie as a member of the family. To purchase a Frenchie puppy in this area expect to pay $3,500.00 to $4,000.00. Some breeders charge much more. Each litter will cost over $4,000.00 for a breeder to produce. This does not include the time and work a breeder puts into each litter. 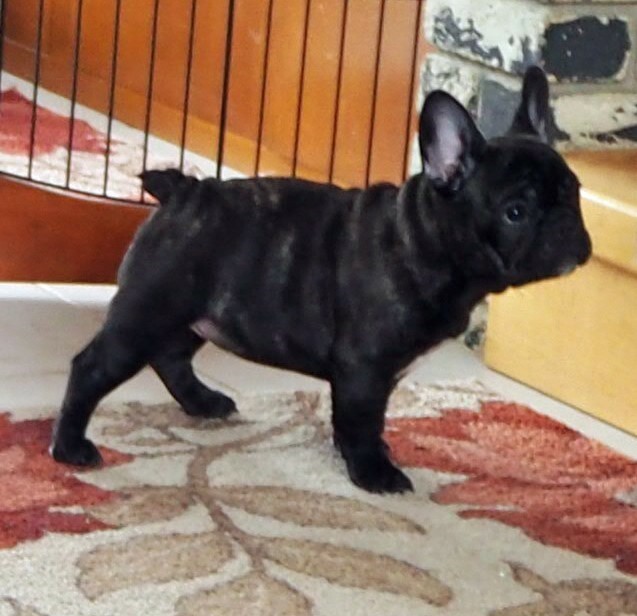 Frenchies usually have small litters, this is not a breed that is easy to produce or raise. When people ask me why Frenchies are so expensive this is only a short explanation of why. Always take the time to buy from a reputable breeder. Adding a new Frenchie to your family should be a thoughtful consideration. Do not buy on impulse. Be sure to connect to a breeder who is interested in making a commitment to their puppy and your family. Please read my contract page to be sure you agree with my terms. I do not ship puppies. You will be required to pick up your puppy.